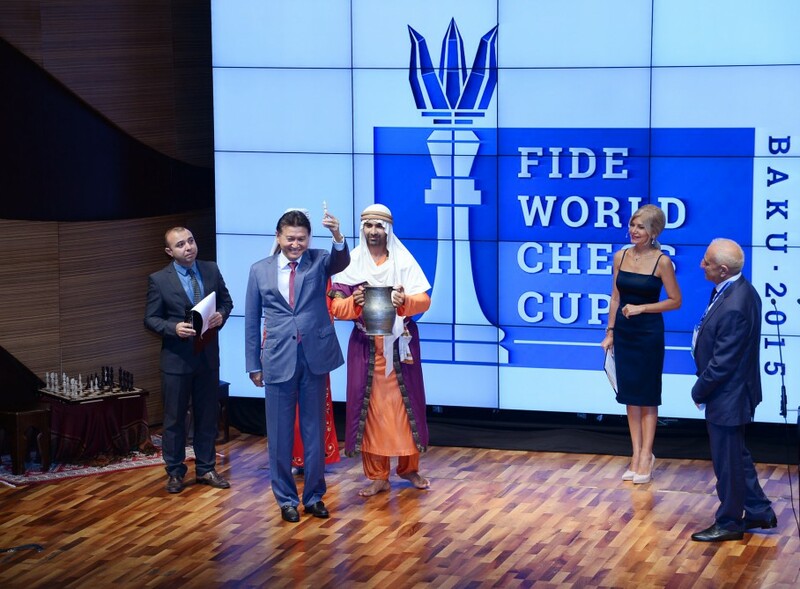 The 2015 FIDE World Chess Cup opened in Baku’s magnificent Mugham Center on September 10. The event was attended by Elman Rustamov, Head of Azerbaijan Central Bank and President of Azerbaijan Chess Federation, Deputy Youth and Sports Minister Intigam Babayev, and FIDE President Kirsan Ilyumzhinov. Many dignitaries, public figures, chess players, and media representatives came from around the world to take part at the opening ceremony to the competition. The President of the Azerbaijani Chess Federation addressed the event, talking about the care that the country gives to nurturing this sport. He said that Azerbaijan is not hosting the event at random. This summer, Baku became the home of more than 6,000 athletes from 50 countries during the inaugural European Games, and now the organizers are making every effort to repeat the same success. Deputy Sports Minister Babayev, for his part, said that Azerbaijan has hosted several international chess competitions thus far. Having hope that the national grandmasters will show good results, he wished good luck to all the players. FIDE’s President, taking the podium, also touched upon Baku 2015, stressing that the significant inaugural Games were held at a high level. “Baku has a developed infrastructure, and here, there are all conditions for doing business and other projects. Chess in Azerbaijan has a long history. Currently, this sport has priority in Azerbaijan, thanks to the adoption of the state program for the chess development. I think the extension of the program will make chess more popular. This World Cup is one of the strongest in the history of such tournaments. In addition, it will include world champion Ukrainian Maria Muzychuk and former world champion Chinese Hou Yifan,” he said. At the ceremony, the guests got acquainted with the origin of chess in Azerbaijan, as many well-known national personalities, including Nizami Ganjavi, Fuzuli, Khagani, Shyams Tabrizi, Mehseti Ganjavi and many others, wrote about this wonderful game in their works. In the drawing of lots, conducted by tournament's Chief Arbiter Faig Hasanov, Ilyumzhinov drew a white piece, meaning that the top-seeded player, Veselin Topalov, will play with white pieces in the first game of the first round. The rest of the pairings will be aligned according to the pairings tree. Some 128 of the world’s best players, including five former world champions, are participating in the World Cup and the finalists will advance to the 2016 Candidates Tournament in the U.S. to determine the World Chess Champion. Regular games and tie-breakers will take place daily from 15:00 local time at Baku’s luxurious Fairmont Hotel in the Flame Towers. Matches consist of two games, except for the final, which consists of four. Players have 90 minutes for the first 40 moves followed by 30 minutes for the rest of the game with an additional 30 seconds per move from the start of the game. If a match is tied after the regular games, tie-breaking games will be played on the next day. Azerbaijan is represented at the tournament by chess players Teymur Rajabov, Shahriyar Mammadyarov, Rauf Mammadov, Gadir Huseynov, Altaj Safarli, and Vasif Durarbeyli. The prize fund of the tournament is $1.6 million.